Simon & Sigalos, LLP is pleased to announce that George L. Sigalos, Esq. was recently featured in the Spring 2018 edition of The Boca Chamber’s quarterly magazine, Connection. 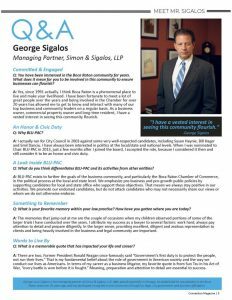 This article features a quick Q&A with George Sigalos about his law practice and involvement in the community. You can read the article below or here.